I am often asked “can I not leave my camera on AI-Servo (AF-C if you are a Nikon etc)? The answer is: not a great idea normally. Because you cannot recompose. The moment you try that, taking your focus spot(s) away from your subject, the camera focuses on whatever is behind the subject! Set your autofocus mode to AI Servo/AF-C. Select “back button focus” in your camera’s menu (i.e. focus when you press a button on the back of the camera, not whenever you half-press the shutter button). Follow the insect, or hockey player, or whatever you are shooting. While doing this, keep the back button focus pressed, so your camera adjusts to follow the subject’s distance. But when the butterfly sits and you want to recompose, let go of the back buttoin focus. You can now move the camera to recompose, yet when you shoot, the camera will not adjust its focus. A quick note about that amazing insect. Nature knows what many beginning photographers do not: you need a catch light in the eye to make it look real and alive. 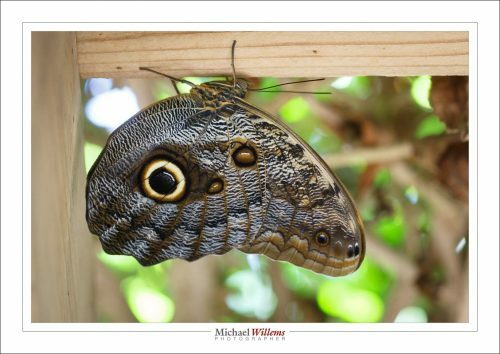 The butterfly’s owl eye has that catch light (the white circle part ion the “pupil”)! Amazing, eh? So learn from nature and always include a catchlight in your portraits.